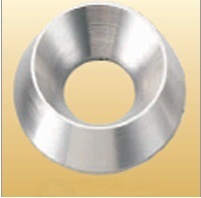 Cup washer made from solid metal in S.S.
Asha Enterprise, successfully positioned in the Domestic as well as International market, is engaged in Manufacturing & Exporting Stainless Steel Fasteners, Anchor Fastener, Hex Bar Nut, Break Off And Shear Off Nut, Studs And Stud Bolts, Cup Washer, Serrated Washer, Precision Turned Part, Machined and Turned Ground Parts, DIN Standard Turned Parts, Drop In Anchors, Switch Gear Components. More than three decades of experience in the industry has given us an edge in achieving technical superiority and consistency in quality. We have our Clientele across the globe, satisfied with Our wide range of Be Quality products. And numbers are increasing rapidly. Besides above we can manufacture & supply any Component as per the customers drawing. To attain maximum customer satisfaction with its outstanding products & services has always been the trademark of the company and it strives hard to delight its customers by providing the same.